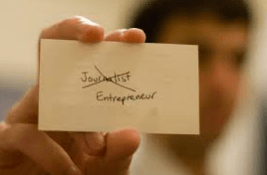 Your new calling card as an entrepreneurial journalist. My endeavor to maintain an independent news and information site, Manchester Ink Link, fits right in to what the industry is signaling to be the next wave in journalism. It will require well-trained journalists with equal parts curiosity and technology skills, a fearlessness to create something vibrant and unique, and the ability to find a way to support the work, either through site sponsorships, a “member model” like NPR relies on, or the addition of banner advertising. There are new ways emerging all the time to make that process work in ways that serve both businesses and advertisers, and journalists who want to keep the boundaries clear, between journalism and revenue. Social journalism is about more than producing “content” and filling space. It is also not just about social media, although we think it is vital for today’s journalists to understand and master these tools. Social journalism is first and foremost about listening. Often, doing so will involve writing stories, but it will also include sophisticated use of data, connecting people with each other, and helping a community to organize and take action. The Open Standard provides online news coverage of open, transparent, and collaborative systems at work in technology and our daily lives. Our purpose is to showcase the positive global impact of these systems and inspire more people to seek out, support and adopt open principles of accessibility, participation and experimentation. The Open Standard is published by Mozilla, a global community of technologists, thinkers and builders working together to promote openness, innovation and opportunity online. We will disclose and be transparent if we take a position on or promote the products and services of Mozilla or a partner company. If you wish to know more, please feel free to contact us.